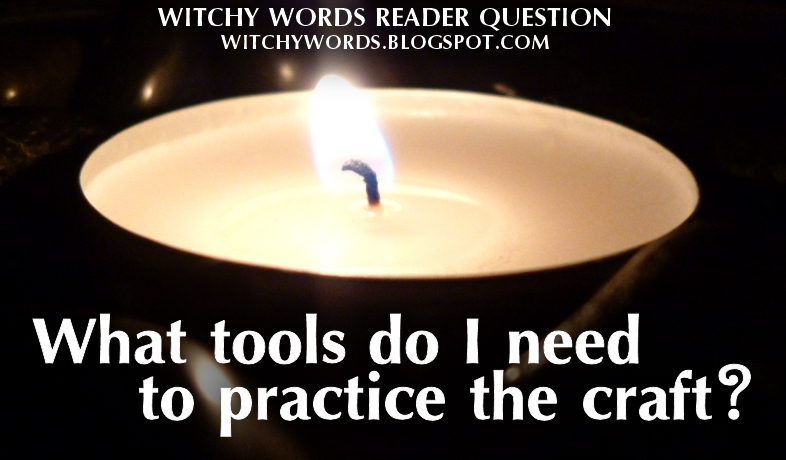 Witchy Words: Reader Question: What tools do I need to practice the craft? Reader Question: What tools do I need to practice the craft? Technically speaking, you don’t need anything to practice your craft and/or religion. For many years, I managed with a small basket of items, and for many years before that, I had nothing to my name. Items are simply a tool meant to channel the energy you already have inside of you. You can do that without anything at all. If you feel you need something to start off with, you could simply use things you find around the house. A bowl of water could represent water, a bowl of dirt for earth, a bowl of ashes for fire, etc. If you don’t have anything specifically representative, you could use paper with writing and symbols. Visualization also goes a long ways. That being said, if you do want to start collecting for your craft, you certainly don’t need to spend much money on it. I picked up my first altar as a curbside nightstand because someone was trashing it (and I still have it!). I purchase things from thrift stores and use common household utensils. I frequent local metaphysical stores, both online and in person, when they’re having sales. I try everything to minimalize the amount of money I throw into my craft. Before you buy anything, I would highly suggest saving most of your money for books. If you’re just starting out, reading is the most essential tool in your bag. Study everything! In fact, I have a list of suggested books for just that here! If you're unsure of where to purchase your books, I prefer Amazon because you can get them for a fairly low price. You may also be able to find them at your local book or metaphysical store. Your local library or metaphysical store may also allow you to check out books on the topic, but you should purchase the ones you find truly useful. The more you study, the more you’ll understand what you feel you need and don’t need to practice your craft. You’ll also find correspondence sheets for things like colors, gemstones and herbs that’ll help you sort out ones you’ll use a lot and ones you’ll barely touch. Below, I may list out some of my personal “standards,” but I would really insist looking up correspondences for each before making any purchases. Your “basic tools” and mine may be different, and the only way to find that out is through study. If you’re truly insistent on picking up a few things up front, candles are always a great starter tool. Tea lights are my staple because they last a while if you need them in ritual, but don’t last forever if you need them to burn out for a spell. White is a pretty universal color, but you can go the extra step and get a variety of colors for a variety of uses. Whatever you buy, make sure they haven’t already been burned (this applies mostly for buying second-hand). Previously-burned candles can already be infused with a certain kind of energy that may not apply to what you’re doing. Many people blow their candles out. That’s fine if you do. If you don’t, you might get a candle snuffer as well. I picked up all of my candle snuffers at thrift stores. Salt and river stones are great for outlining your circle and protecting it, but you can do the same thing through visualization. You may also want to get a journal - something you can keep your experiences, thoughts, correspondence sheets, etc in. This may be your BOS or your Grimoire or both, depending on your beliefs. For herbs, most stores sell a basic collection somewhere. If you really need to pick up individual herbs, I’d suggest salt (definitely salt), black pepper, bay, basil, cinnamon, cloves, garlic, mint, rosemary and sage. Typically speaking, however, I just buy as I need, particularly because they can become stale over time. Your local metaphysical store or online stores, including sellers on Etsy and Amazon, typically carry a basic set of gemstones for use. If you need to pick them up individually, I’d suggest quartz as a go-to all-around stone for most uses. You could do just about anything with clear quartz. More stones include amethyst, carnelian, citrine, fluorite, hematite, jade, lapis lazuli, moonstone, obsidian, rose quartz, smoky quartz, sodalite, tiger’s eye and turquoise. You may also want to invest in some sort of recording journal. It could just be a cheap notebook (my first one was), a sketchbook or a three-ring binder with some paper. Or you could go all out and invest in a leather-bound journal or a refillable wooden grimoire. It's really up to you. Personally speaking, I would keep your craft journal cheap until you're certain of what you're doing because your beliefs are going to change often throughout the first few years of practice. Some other standard tools for specifically Wicca and some branches of paganism include a bell, a chalice, athame, cauldron, incense and incense burner, a wand, sage sticks for smuding, and a robe. However, these are also tools that can be picked up as you go. It took me seven years to find a bell I truly liked, and longer for a chalice. I found a great cauldron earlier this year. I still do not own an athame. My wand? A stick I found outside that I liked and sanded down. Your chalice could be a cup you really like. Your altar could be a small table or a piece of wood or even a book you like. And of course, if you're following another pagan lineage or practicing Witchcraft, you may not need any of these. It’s really all up to you and how it feels to you. Some online places and metaphysical stores carry “mini altars” or “traveling altars” which can be great starting tools. I don’t have any specifically to suggest as I’ve never invested in them, but they always look amazing. So again, as far as tools go, you truly do not need anything to start with. However, if you find you’re really wanting to start a collection, above should give you a starting point. Best of luck to you! Right on! I have tea lights, incense and incense burner, salt, some gemstones I found, and some runes I made myself. I've never felt the need to have anything else, unless I am working with herbs which I tend to have on hand anyway. Your practice is what you make it and does not require a bunch of tools. Exactly! I get this question a lot and I simply cannot stress enough that you really don't need anything at all. I think I called a circle when I was younger with the symbols of the elements drawn on torn sheets of lined paper. If you need visual cues, money doesn't have to be involved at all. One of the awesome things about this religion is its 'non-authoritarianism'- while gathering knowledge and wisdom from others is great, ultimately only YOU can decide what you need. Goodness, I truly appreciate your comment! I've answered this question multiple times but completely forgot to put in the library and journal notes for this entry. They're both so important! I've added them in. Thank you so much!